As if to prove I truly use the shuffle function, up comes a Michael Buble tune that, although nice, is not anywhere near the top of my musical food chain. Typically, I’ll hit next when one of his songs comes up in the queue. Not this time though. 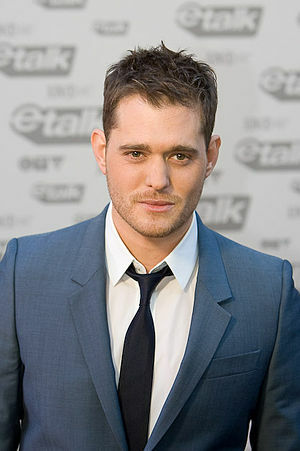 Michael Buble is a huge world-wide superstar, a Canadian crooner at the top of his craft. He sells out anything and anywhere. His style is a throwback, a scotch drinking smoker with a crazy sense of humour, and, of course, a great singing voice. This tune, “Comin’ Home Baby, is from his “Call Me Irresponsible” album and is a duet with Boyz II Men. The song is a jazz tune from 1961, originally done by the Donald Bailey Quartet, later recorded and turned into a hit by Mel Torme. Many artists have covered it, including Herbie Mann, David Sanborn and Quincy Jones. Enjoy, and let’s hope the shuffle God is kinder next time. This entry was posted in Canadian Music, Jazz, Music, Song Of The Day and tagged Comin' Home Baby, Jazz, Michael Bublé, Music, Song Of The Day. Bookmark the permalink. Love the historic background of the song – it’s quite a pedigree. buble is good at what he does, and there are definitely times when I appreciate that sound. Same feeling on bubbles. Have to be in the right mood and then I really enjoy him. Buble is a true crooner of the times. Personally, I like his music. Hi Frank, I see we hiatused at the same time. I should be giving it heck again this weekend or next week. Surprisingly busy. I have Bubbles on my iPod but tend will skip a song if I’m not in the mood. Definitely like him. And that’s OK as music is so much about mood.